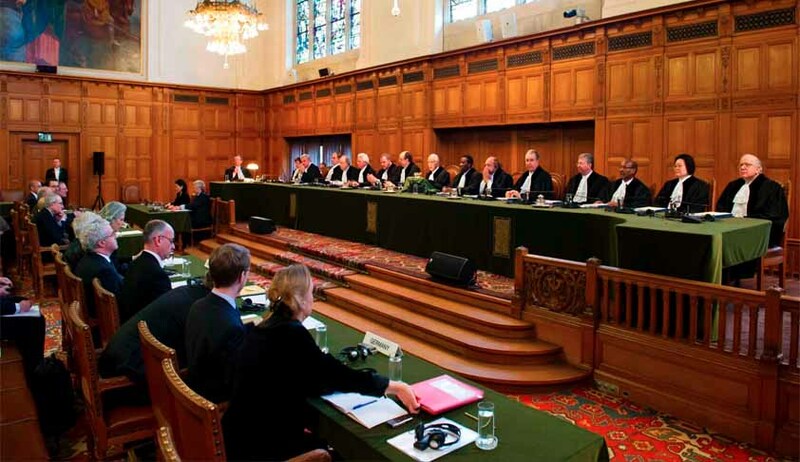 The International Court of Justice at The Hague, Netherlands will hold public hearings from 15 May, on India’s Petition seeking a stay on the execution of former Indian Navy Officer Kulbhushan Jadhav, who was sentenced to death by a Pakistani Military Court on espionage charges. A letter has been sent in this regard to Pakistan Prime Minister Nawaz Sharif. The Appeal filed by India will be argued by a by a team of lawyers led by Senior Advocate Harish Salve. India has accused Pakistan of “egregious violations of the Vienna Convention”. It has contended that it was not informed of Mr. Jadhav’s detention until long after his arrest, and that Pakistan failed to inform him of his rights. It further alleges that, in violation of the Vienna Convention, the authorities of Pakistan are denying India its right of consular access to Mr. Jadhav, despite its repeated requests. It has brought to the notice of the Court that Pakistan had subsequently requested assistance in the investigation, and had informed India that consular access would be considered only in the light of India’s response to such request. This linking, India has now contended, is “by itself a serious violation of the Vienna Convention”. India has thereafter pointed out that Mr. Jadhav’s execution “would cause irreparable prejudice to the rights claimed by India”. It, hence, demanded an immediate suspension of Mr. Jadhav’s death sentence, submitting that “[w]ithout the provisional measures requested, Pakistan will execute Mr. Kulbhushan Sudhir Jadhav before th[e] Court can consider the merits of India’s claims and India will forever be deprived of the opportunity to vindicate its rights”. India has further sought a direction to Pakistan to annul the decision of the Military Court. In case Pakistan is unable to annul the decision, it has sought a declaration that the decision is illegal, being violative of international law and treaty rights. Mr. Jadhav was awarded death sentence last month by the Field General Court Martial in Pakistan, evoking a sharp reaction in India which warned Pakistan of consequences and damage to bilateral ties if the “pre-meditated murder” was carried out. While India acknowledges that Jadhav had served with the Navy, it denies that he has any connection with the Government. The Appeal on Mr. Jadhav’s behalf was given last month to Pakistan’s Foreign Secretary Tehmina Janjua by Indian High Commissioner Gautam Bambawale, who also handed over a Petition by Jadhav’s mother, expressing the desire to meet him, and seeking the Pakistan Government’s intervention for his release. The India-Pak Joint Defence Committee for Prisoners (IPJDCP), a forum of lawyers from both the countries, had also petitioned before the Pakistan Supreme Court last month. The petition was drafted under the Chairmanship of Prof. Bhim Singh, a Senior Advocate from the Supreme Court of India, demanding that “the order/ malafide judgment/ authoritarian order ordering death sentence to an Indian civilian be set aside and a fair trial within the meaning and scope of the Constitution of Pakistan may be held by an appropriate court of law in accordance with the rules and procedure prescribed to hold a trial against a civilian by providing him reasonable legal aid/assistance”. Subsequently, a Division Bench of the High Court of Delhi had dismissed a PIL seeking a direction to the Government to approach the International Court of Justice for securing Mr. Jadhav’s release. The Court was of the view that the Petitioner was presumptuous that there can be a straitjacket formula which can be applied in every instance of abduction or kidnapping of Indian citizens abroad. “During the course of hearing, the petitioner has himself pointed out the wide divergence in the situations that may arise when he refers to a kidnapping of Indian citizens by Somali pirates (when the respondents admittedly succeeded in securing release) and to the case in hand. Therefore, this matter best deserves to be left to the expertise and assessment by the respondents,” it had observed.